All our nigiri sushi is expertly made every day. Try our fresh, organic salmon nigiri for a super healthy meal at a great price! Try our huge range of don toppings and enjoy a traditional Japanese lunch at any time. Umai has over 60 varieties of rolled maki sushi so you can enjoy something new and delicious every day. 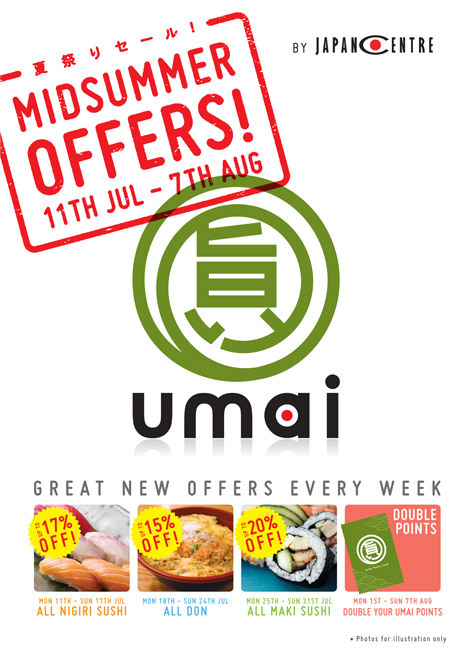 Get an extra stamp on your umai points card every day this week so you can get closer to your free gifts sooner. Our authentic Miso Soup is now just 50p! Miso soup is a delicious side dish for every Japanese meal. Made with healthy miso paste, tofu and spring onions, our miso soup is the cheapest in London! Posted in Food, Stores. Bookmark the permalink.